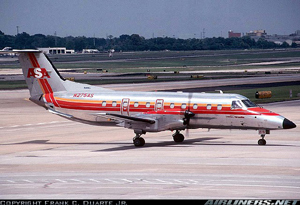 On April 5, 1991, Atlantic Southeast Airlines, Inc., Flight 2311, an Embraer EMB-120, N270AS, crashed during a landing approach to runway 07 at the Glynco Jetport, Brunswick, Georgia. The flight was a scheduled commuter flight from Atlanta to Brunswick, Georgia, and was being conducted under instrument flight rules. The airplane was operating in visual meteorological conditions at the time of the accident. Due to the crash, the aircraft was destroyed. The two pilots, the flight attendant and all 20 passengers were killed. Flight 2311 was cleared for a visual approach to Glynco Jetport a few minutes before the accident. Witnesses reported that as the airplane approached the airport, it suddenly turned or rolled to the left until the wings were perpendicular to the ground. The airplane then fell in a nose-down attitude and disappeared out of sight behind the trees.